The TA-2909-PIK is an electrified security door hardware integration solution kit. 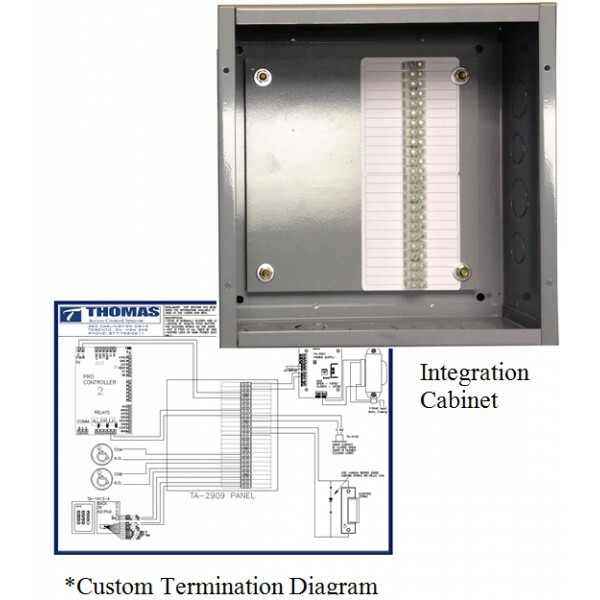 Each kit includes a *customized termination diagram, and a system integration point cabinet. The cabinet is made from 18 gauge steel with a corrosion resistant finish. Furnished with each cabinet are 24 labeled screw terminals, which allow for tidy and reliable system connections. With a removable back-panel and multi-sized knock-outs, the included system integration cabinet can be easily incorporated into any electrified door hardware system. *Dealer must submit a completed TA-2909-PIK configuration form at time of order. K.M. Thomas Company Ltd. will make every effort to provide a functional termination diagram based on the specified hardware and Dealer provided description of operation. If the specified hardware cannot provide the functions described by the Dealer provided description of operation K.M. Thomas will provide a quotation for the recommended additional components. K.M. Thomas Company Ltd. does not assume responsibility for the suitability or functionality of systems and components not specified by K.M. Thomas Company Ltd.
**Must be ordered with TA-2909-PIK.